Jennie Jones is at the bar! Our guest in the Calypso Bar this week is champagne lover, Welshwoman-turned-Westralian, and author of the wonderful new romance, “The House on Burra Burra Lane,” Jennie Jones. Jennie, welcome to the Calypso Bar! Just ten days after her fresh start in the isolated Snowy Mountains, Samantha Walker trips over a three hundred pound pig and lands in the arms of Dr. Ethan Granger — and the firing line for gossip. It was hardly a ‘date’ but sparks of the sensual kind are difficult to smother in a community of only 87 people. Now there’s a bet running on how long she’ll stay and what she’ll get up to while she’s in town. Ethan has his own issues — Sammy’s presence in his childhood home brings with it painful recollections of family scandals and a bad boy youth. When the gossip around them heightens, his life is suddenly a deck of cards spread on the table for all to see. Then Sammy’s past catches up with her… and it looks like all bets are off. Leaving your idyllic rural setting for a while, let’s talk about your desert island essentials. What book could you not bear to be without? Merriam-Webster’s Thesaurus – although it would be redundant if I didn’t have a computer on the desert-island to write a new story because I have terrible handwriting. But just think – I’d be rescued one day and the heroic helicopter pilots or seafaring navy seal type guys would be astounded at my knowledge of synonyms, idioms and antonyms. (How to be Rescued by a Hot Guy by Using the Right Words). Hmm. Workaholic much? You’re on a desert island: relax! But it’s good news for your readers, anyway! I’m loving the thought of your rescue heroes. Does that mean your essential desert island companions aren’t hunky heroes? Who would you like to be stranded with? Something for everybody in that party! 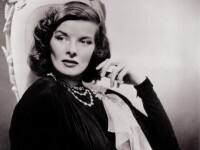 Kate Hepburn is one of my all-time favourite role models. What would you all be drinking, do you think? Champagne’s never boring! Throw in a strawberry? We can do that! 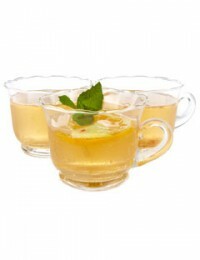 And given our elegant island company, why not an equally elegant champagne punch? This one even has a nod to a pina colada! Pour all your liquid ingredients in a punch bowl and decorate with sliced fresh pineapple and orange and plenty of fresh mint. And don’t forget those crushed fresh strawberries! Now, what’s on your desert island playlist? Gracie, are you sure you want me on your desert-island? I’d pick the original West End cast version of Les Miserables (although HJ – Hugh Jackman – did a stellar job in the movie), a selection of forties, fifties and eighties songs, and just so I could cry myself to sleep if feeling lost and unloved (when not at the Calypso bar with Gracie), I’d watch Lara Fabian sing Caruso live on YouTube. She has the most extraordinary range in her voice and her interpretation of words is exquisite. She is the best – alongside Barbara Streisand and Judy Garland – check out those two singing Happy Days /Forget Your Troubles on YouTube – I get goose bumps every time I listen. Every time. Les Mis, Streisand, Garland… I think we’d make perfect desert island companions, Jennie! Now, where can we find you and your book when you’re not hanging out in the Calypso Bar? I have my author website, and my Facebook page. And you can find buying links for The House on Burra Burra Lane here. Trust you to beat me to the Bar, JJ. Hooray! Great to find you in the bar Jennie Jones! But please forgive me if I won’t really be bopping out to your music!